The new shape of fashion nails - imPRESS Oval Gel Manicure! 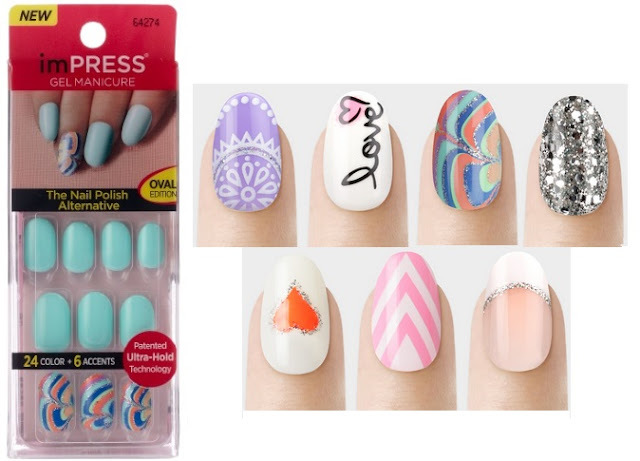 imPRESS Oval Gel Manicure - $9.99 - the same imPRESS that we`ve always known and loved with a new oval shape as well as 7 new colours and designs: Funky Town, Shocking, Gossip Girl, Lighten Up, Shake It Up, Next Wave and Pop Star - including 12 sizes of 24 fashion nails as well as 6 accent nails. They apply in minutes with no mess or dry time and last up to 1 week - they`re even waterproof - and when you`re ready to remove, just peel them off - no soaking and no damage to the nail underneath!